From 800AD the Vikings began to make an appearance, their towns are recognised by the name suffixes of -by or -thorpe. It is a common misconception that the Vikings had horns on their helmets, no evidence for this has ever been found. However it is well recognised from the ecclesiastical writings of the time that their raids were much feared. a) The Danes from Denmark landed on the east coast of England. 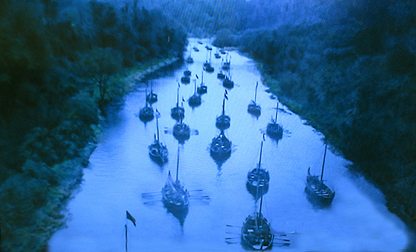 The Danes led by Guthrum established by treaty with Alfred of Wessex, the Danelaw, whose southern boundary lay approximately along lines drawn from the Thames to London, north along the river Lea to its source then a straight line to Bedford, then to the river Ouse and finally to Watling Street. b) The Norsemen from Norway, landed on the West coast, Old Cumbria and Lancashire. All but the West Saxons (Wessex), controlled by Alfred, fell to the Vikings which was the most distant from their incursions. Wessex recovered the other three when Eric Bloodaxe, ruler of York died in 954. Wessex used a system of BURGHAL HIDAGE (an Anglo-Saxon document) to defend the city walls. A person owning one hide of land had to contribute one man to defend the walls. Four men were needed to defend one pole of wall (1 pole = 5.5 yards) or 4 1/8 feet per man. Knowing the number of hides it could be used to calculate the length of walls needed. This idea spread to the Midlands (Mercia) as they were reconquered. Unlike the later Normans the English never built castles, only walled towns. Norman castles were built to dominate towns and Anglo-Saxon houses were removed to allow them to be erected. A system of burghs (Anglian: burhs) are evident in South Yorkshire which may represent a fortified line against the Danes, which appears to follow the Magna Via, the old road running from the North to the south of England, and may in fact have led to its development as a main transport route. By 851 the Vikings began to make permanent settlements. 865 autumn - Halfdan "settled his warriors to the plough". Halfdan & Ivar the Boneless, sons of Ragnar Lothbrok came to an understanding with the East Anglians, but by the following autumn this army left East Anglia, using horses, moving quickly, circuiting The Fens and taking York (1st November 866). The Northumbrians were weakened by civil war. 867 The A/S Northumbrians attacked the Danish army in the spring at York both inside & outside the Roman defences. Both Northumbrian leaders were killed and Northumbria ceased to exist as a political power. 867 The Danes left York in the autumn for Mercia and established a winter quarters at Nottingham (Snoetingham). Danish settlers preferred the flatter areas as in Denmark, whereas the Norse settled the mountainous areas e.g. Cumberland, North Yorkshire Moors and The Pennines. A force was sent from Wessex but the Danes held the position and no major battle took place. Sheffield museum possesses one of only two surviving A/S helmets. It has a bronzed boar on top. It was found at Benty Farm in Derbyshire where there are a large concentration of burial sites. Could this be a Mercian graveyard following sorties into Northumberland? 868-9 Winter- The Danes returned to York which they called Jorvik (c.f. Jarvik). 869 Autumn- The Danes returned to East Anglia & set up winter quarters at Thetford. Shortly after they met & defeated an army led by Edmund of the East Anglians (near Hoxne in Suffolk). On this second entry into E. Anglia the Danes were brutal. 870 (late) The Danes left Thetford and encamped at Reading between the Thames & Kennett rivers. On the Berkshire Downs ("Ashdown") the Danes were beaten back in a hard fought battle. 871-2 (winter) The Danes stayed in London with a brief incursion into Northumbria. Thus most of this Danish movement went through the region between the Humber Marshes and what is now S.W. Yorkshire probably along the existing Roman road through Doncaster and Tadcaster to York. a) Under Halfdan they moved from Repton to Tyne and harried Picts & the Strathclyde Welsh. At Repton (Derbs.) a pagan burial was found in a churchyard which is believed to have been part of the winter camp of the Danish army in 7841. There is little evidence for Danish burials. Some are undoubtedly beneath present day cemeteries. 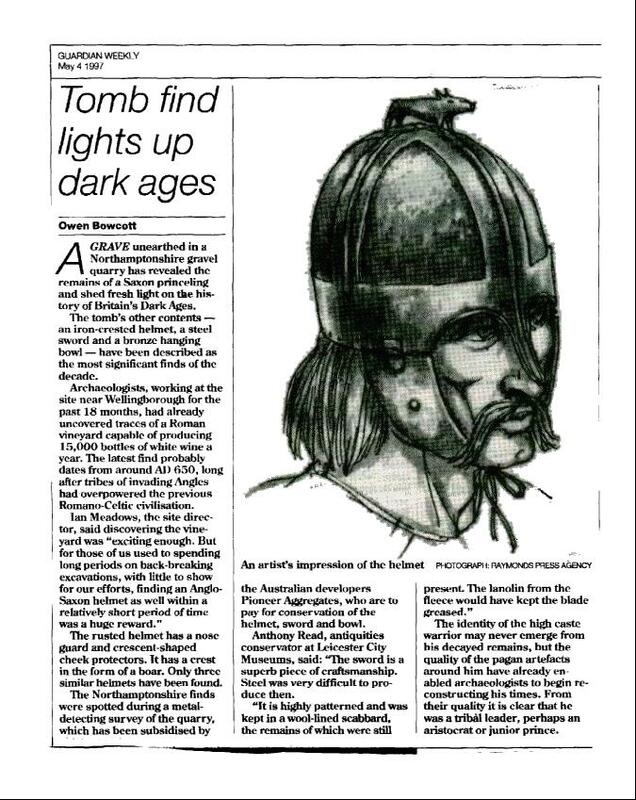 Where they are evident they were buried with pagan grave goods but they appear to have accepted Christianity quickly.The Danish males were often buried with their weapons such as spears. The Middleton Cross near Pickering, Yorkshire shows a pagan burial with a spear on a Christian Cross. By the 800's Wessex under Alfred was ascendant he later unified England in the 900's under one crown. Alfred built fortified towns, grouped villages together into "HUNDREDS" and had disputes settled at a meeting of the hundred. Hundreds later became SHIRES, many shires are old kingdoms e.g. Essex, Sussex, Cumbria, Northumbria. In 878 all of England was overun by Vikings. The later Viking villages took the less productive areas, the English were already established in villages, hybrid named villages combined Danish and English land, which the "Anglo-Saxon Chronicle" called "sharing out the lands"
900 Edward the Elders reign begins, he reconquered the Danelaw. A hoard of gold dated at 906 was found in 1840 at Cuerdale. It was found in a lead lined chest forty metres from the bank of the river Ribble, where the M6 now crosses the river. One thousand ounces of scrap silver ingots and 7000 silver coins were taken from Ireland by Norwegian Vikings. Mostly English and Danish coins were present but some were from the Middle East2. 925 Athelstan's reign begins. The Danelaw is divided into shires with market towns of the same name. 929 Athelstan, son of Edwin The Elder raises York to the ground to remove Norse influence under Olaf. 937 Battle of Brunanburg Lancashire V's King Constantine of Scotland. 955 With the Death of Eric Bloodaxe comes an end to the Scandinavian attempt to settle an independent kingdom between Dublin & York. Wessex takes Northumberland along with East Anglia and Mercia. 959 Edgar's reign begins, an "Age of Peace" which develops until 975 when Edgar's reign ends. 978 Ethelred ascends, he raises Danegeld, a tax to pay off the Vikings. 1013 Swein landed at Sandwich, Kent then turned north to the Humber passing up the River Trent and established a camp at Gainsborough. Swein was accepted as king of the Northumbrians and all the Danes of East England attacked various places inland. 1017 Swein's son Cnut ascends the throne to rule an English-Danish Empire. Cnut became a Christian. One year after Cnut's acession, Swein gave Northumbria to Eric of Hlaoir but this lasted only a year or so. Before his death in 1035 Cnut appointed a vigorous Danish warrior Siward to the Northumbrian Earldom. Siward established a firm hold on the western parts of the border district and was strong enough to hold back Strathclyde. 1055 Siward dies after defending the northern Marches for many years. He helped Malcolm Canmore to defeat Macbeth. His eldest son Earl Gospatrick (?killed 1138) also died leaving his son Waltheof who was too young at the time. Siward had married into the native line of Northumbrian earls and his son Waltheof (=Walter?) became Earl of Northumberland and an important figure in early Norman times. Because Waltheof was too young, Godwine's son Tostig became Earl of Northumberland in 1055. "Orm Gamal's son brought St. Gregory's church down it fell to broken and he had it built anew from ground in honour of Christ St. Gregory. King Edward in the days of Earl Tostig" The church had been rebuilt by a Dane probably from Mercia with a Scandinavian personal name 150 years after it had been sacked. 1063 (spring) Tostig led a force from Northumbria to North Wales. 1065 (autumn) There was a Northumbrian rebellion against Tostig's harsh rule.Only about 200 rebels march on York while Tostig was visiting Edward The Confessor near Salisbury. They Seized Tostig's treasury and killed his supporters. They outlawed Tostig and invited Morcar, the brother of Edwin, Earl of Mercia to be the Earl of Northumbria. The Northumbrian army swelled picking up Mercians on its way south. They took Northampton & Morcar was confirmed as Earl of Northumbria., Tostig went into exile. 1066 (spring) King Harold (Harold Godwinsone, he was elected and not of Royal stock, but his family had maintained order during internal wars) marched north to Northumbria5. At Easter he went south again from York to London Halley's comet was seen on the 24th April 1066. Tostig attacked the S.E. coast, East Anglia, and then sailed up the Humber, he did much damage to Lindsey and was driven off by Edwin of Morcar. Tostig returned to the Humber with Harold Hardrada and the Scottish in 300 ships, they passed up the River Ouse and anchored at Riccall. Harold of Norway marched towards York but 2 miles south of the city at Gate Fulforda battle ensued on the 20th September 1066 against Edwin of Morcar. The English were defeated and terms were made with Tostig. 1066 24th September Harold reached Tadcaster. 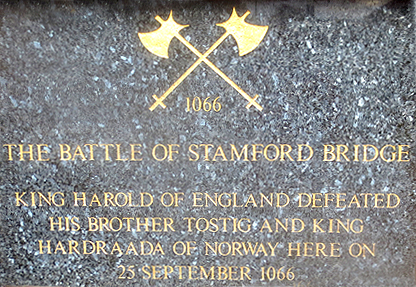 1066 25th September Harold's army covered covered 9 miles to York and another 7 to the east, he attacked Tostig and his supporters at Stamford Bridge on the River Derwent. Tostig's army suffered such losses that they only needed 24 of the 300 ships to take the survivors away. Both Tostig & Harold were killed. The preservation of the present day site of the battle of Stamford Bridge is an insult to any true Englishman. The site is covered by a caravan park and a housing estate, which in my opinion is a sad indictment of the way the descendants of the usurpers recognised the importance of this battle in weakening the resistance of the English to the Norman invader in the south. 1066 1st October Harold and his army headed south to meet William of Normandy, the rest is history! Later FEUDALISM developed where peasants owed service to the lord of the manor ("Thegn"). 2. Anglo-Saxon England. David Brown, Bodley Head, 1978. (C) Tim Midgley, April, 1999, revised 3rd January 2019.